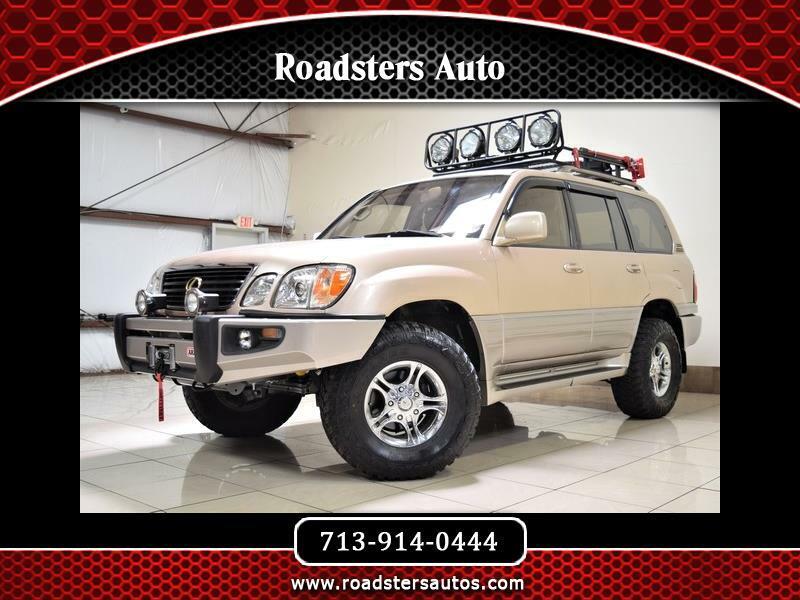 ROADSTERS AUTO IS SHOWCASING FOR SALE THIS CUSTOM ONE OF A KIND 2001 LEXUS LX470 4WD LIFTED OFF ROADING! THIS SUV IS FEATURING TAN COLOR EXTERIOR ON BEIGE LEATHER INTERIOR! WITH 150K ORIGINAL MILES IT LOOKS CLEAN INSIDE AND OUT. IT COMES LOADED WITH OPTIONS SUCH AS POWER WINDOWS AND LOCKS, POWER MIRRORS, CD PLAYERS, OFF ROADING LIGHTS,16 INCH WHEELS, BRAND NEW BIG TIRES, HID LIGHTS, TOWING PACKAGE AND MANY MORE(SEE THE PICTURES FOR MORE DETAILS)! THE POWERFUL 8 CYLINDER 4.7L ENGINE RUNS LIKE NEW AND THE 4WD AUTOMATIC TRANSMISSION SHIFTS SMOOTHLY INTO GEARS AND PROVIDE SOME GOOD POWER! THE TAN COLOR EXTERIOR IS IN GOOD AND HEALTHY CONDITION, AND THE BEIGE LEATHER INTERIOR HAS BEEN KEPT CLEAN! THE OVERALL CONDITION OF THIS LX470 IS GOOD, AND IT IS PRICED TO SELL QUICK SO DON'T LET IT SLIP AWAY AND CALL US NOW AT 713-914-0444 TO BUY IT NOW! Message: Thought you might be interested in this 2001 Lexus LX 470.